OAK RIDGE, Tenn., March 20, 2019—Direct observations of the structure and catalytic mechanism of a prototypical kinase enzyme—protein kinase A or PKA—will provide researchers and drug developers with significantly enhanced abilities to understand and treat fatal diseases and neurological disorders such as cancer, diabetes, and cystic fibrosis. The discovery was made by an international team of researchers using macromolecular neutron crystallography at the Department of Energy’s Oak Ridge National Laboratory and the Institut Laue-Langevin in Grenoble, France. Building on a decade-long investigation, the combined efforts revealed previously unknown characteristics of the archetypal protein kinase, including a complete map of the atomic structure and the underpinnings of the enzyme’s chemistry used in cellular signaling. The details are published in the journal Science Advances. Kinases are a large group of hundreds of enzymes responsible for initiating and regulating myriad cellular processes. Kinases send signals to proteins by way of phosphorylation—adding a reactive chemical group consisting of phosphorus and oxygen to a specific location on a substrate protein to activate its specific biological function. Problems arise when gene mutations cause kinases to work improperly, which in turn leads to disease. A malfunctioning kinase, or one that can’t be deactivated, could be responsible for the overexpression of proteins that lead to the uncontrollable propagation of cancer cells. The opposite is also true in neurological disorders in which a malfunctioning kinase simply causes cells to die. Changes in the protein structure due to mutations can be difficult to detect even though the effects of mutations on the protein dynamical behavior can be quite profound. However, these dynamical behaviors become more apparent by examining the overall hydrogen bonding network throughout the protein. Neutrons are uniquely sensitive to light elements such as hydrogen. Because approximately 50 percent of all atoms in proteins are hydrogen, and most of the chemical reactions that enzymes catalyze involve hydrogen, neutrons are an ideal and unsurpassed probe for detecting the positions of hydrogen atoms within the protein structure and tracking their movement during catalysis. Neutron diffraction using the IMAGINE diffractometer at ORNL’s High Flux Isotope Reactor, a DOE Office of Science User Facility, and the LADI-III diffractometer at ILL enabled researchers to see the exact positions of hydrogen atoms to reveal the complete kinase structure as well as the protonation states of all amino acids in PKA and the ligands bound to its active site, many of which were previously unknown. “Neutrons enabled us to validate x-ray predictions of hydrogen atom positions, as well as determining the protonation states of chemical groups that were not known, or in places where we didn’t expect to find them. 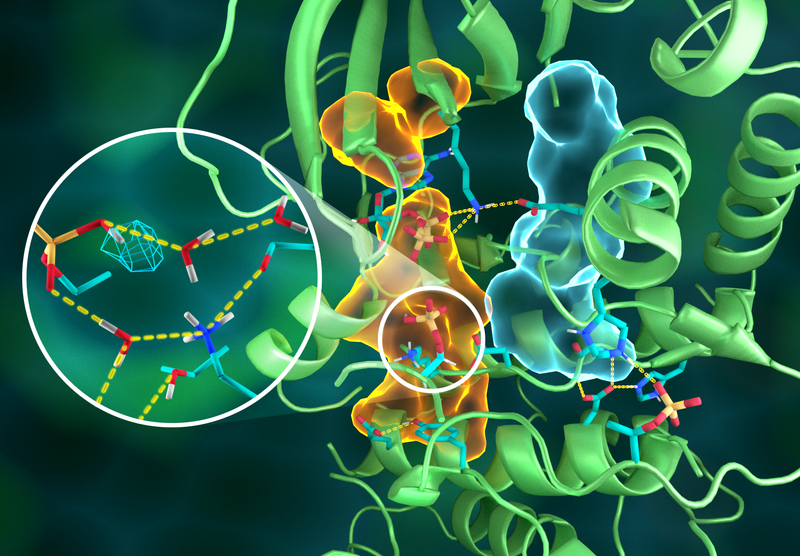 This major chemical advance paves the way for more sophisticated molecular modeling and simulation studies of protein kinase structure and function,” said corresponding author Susan Taylor. The paper’s co-authors include lead author Oksana Gerlits, Bredesen Center of the University of Tennessee–Knoxville; Kevin L. Weiss and Andrey Kovalevsky, ORNL; Matthew P. Blakeley, Institut Laue Langevin, Grenoble, France; Gianluigi Veglia, University of Minnesota; and corresponding author Susan S. Taylor, University of California–San Diego, who initiated this effort through a joint project funded by the University of California and Los Alamos National Laboratory. The research at ORNL was supported by DOE’s Office of Science. UT-Battelle LLC manages ORNL for DOE’s Office of Science. The Office of Science is the single largest supporter of basic research in the physical sciences in the United States and is working to address some of the most pressing challenges of our time. For more information, please visit http://science.energy.gov/.